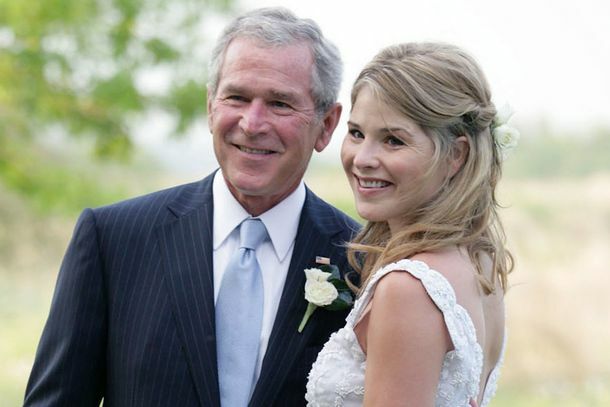 George W. Bush Is Being Celebrated As a ‘Feminist’ Now, Why NotAccording to daughter Jenna Bush Hager. See Pharrell’s Side-Eye When Jenna Bush Confused Hidden Figures and FencesNot the same film. Jenna Bush Confused Hidden Figures and FencesNot the same film. Jenna Bush on White House ‘Hanky-panky’ IncidentA look back. Meet the 4 Women Who (Sort of) Know What Sasha and Malia Are Going ThroughAmy Carter, Chelsea Clinton, and the Bush twins. Jenna Bush’s Childbirth Was Just Like a Rom-ComHer water broke at her baby shower. George W. Bush Is a Grandfather Jenna had a girl. Jenna Bush and Chelsea Clinton Both Go to SoulCycleAt the same time! Good Luck Getting to Rhinebeck This Weekend If You’re a Normal PersonBus companies have canceled service to the area. Could All This Madness About Chelsea Clinton’s Secret Wedding Have Been Avoided?Probably. Let’s start with the “secret” part. Russell Brand Made Out With Someone’s GrandmaDon’t tell Katy Perry. James Franco’s Rep Won’t Let Him Talk About His SexualityAnd other happy gossip news! Jenna Bush Interviews Bill ClintonWe’re betting her dad had two reactions to this. We Are Really Excited for Jenna Bush’s New Gig on the Today ShowRemember that time Ellen DeGeneres got her to call her parents at the White House on live television? Bad Boys III Possibly Coming for YouPlus: Nicolas Cage! Jenna Bush! Tia and Tamera Mowry! Just in Time for Thanksgiving, Adorable Presidential-Family StoriesThis is exactly why we elected Malia and Sasha Obama. Jenna Bush’s Wedding Dress and John Galliano’s New York ShowJenna Bush’s wedding gown was very textured, John Galliano shows his Christian Dior resort collection here tonight, and bobo is the new boho. Jenna: A Bush Everyone Can Smile AboutEven though we were initially mad she didn’t get married at the White House, Jenna and Henry’s wedding pictures put a smile on our face. Ralph Rucci Takes Top Prize; Karl Lagerfeld Inspires HimselfRucci nabbed the fashion prize in the American Design Awards, Karl Lagerfeld was his own muse for his new handbag line, and Beyoncé proved people don’t really eat dinner at the Met gala. Jenna Bush Not Necessarily Voting for McCain (Gasp! )Jenna Bush splits from her family and says she will listen to all of the candidates! What’s Not So Elegant About Jenna Bush’s WeddingWe don’t know what Jenna’s wedding dress will look like yet, but we do know it won’t be easy or comfortable for guests to attend this wedding. Laura Bush to Host ‘Today’!The First Lady–for–a–little–while–longer will make a very special appearance on the ‘Today’ show next week. Australia Bans Young Models; Gisele May Star in ‘Austin Powers’A provocative image of a 14-year-old model sparks controversy in Australia, Oscar de la Renta designs Jenna Bush’s wedding gown, and Jessica Stam devours carbs. Eric Nederlander Just Can’t WinBroadway scion Eric Nederlander is divorcing his second wife just seven weeks after having a daughter with her. Theodora Richards is now vice-president of creative direction at some jeans company. Maxim gave Nas’s new album two and a half stars despite the fact that it’s not even done yet. (They did the same thing to the new Black Crowes record.) Grey’s Anatomy star Sara Ramirez flipped out at a midtown bar after a female fan chatted up her boyfriend. Lorne Michaels is in talks with a major Vegas casino to create a live SNL revue starring former popular cast members. Jay-Z ‘Took Rihanna Aside’ to Talk About Rumors of Their AffairRihanna said she used to feel self-conscious about the rumors that she hooked up with Jay-Z, but now just ignores them. Observer prepmaster general David Foxley will now be the person to call to get reservations at the Waverly Inn. Billion-heiress Anna Anisimova slept at her mother’s place on Tuesday, which is a good thing because a 400-pound Venetian chandelier collapsed and fell fifteen feet onto the bed at her own place. Rapper 50 Cent has to pay an undisclosed sum to a Post photographer for knocking him down after he tried to take a photo of him. MSNBC accidentally flashed a graphic of Osama bin Laden as host Chris Matthews was discussing Barack Obama. Robert John Burck, a.k.a. the Naked Cowboy, says he has high-profile investments. DJ AM has invited ex-girlfriend Mandy Moore to hear him spin at Room Service on Friday. Bush Says State of the Union Will Mostly Address Economy; Guest List Begs to DifferAre you guys as excited for President George Bush’s State of the Union Address tonight as we are? Hoo-ah! Wait. You realized there still is a president, even though everybody’s busy trying to pick who the next one will be, right? We know, it’s hard to remember. And even though there are primaries tomorrow, tonight belongs to current president George Bush. Early reports say that his address will largely focus on the economy, which is probably what most ordinary citizens are hoping he will talk about. “Expect few surprises and no big initiatives,” says the Associated Press. Housing reform will come up, press secretary Dana Perino says, as well as health care and veteran’s care, alternative energy sources, climate change, faith-based initiatives, and conditional troop withdrawal in Iraq. But today the list of Presidential guests has been released for the event. These are the people who sit up with Laura Bush in the balcony, who are generally alluded to in the text of the speech (to much unilateral applause). In addition the lovely Bush twins and that sexpot Lynn Cheney, we’ve summarized the guest list for you. Neal Boulton Wants, Doesn’t Want AttentionFormer Men’s Fitness editor and Jann Wenner paramour Neal Boulton calls up “Page Six” to tell them that he is getting harassed for being “too straight.” Harvey Weinstein said he uses Vogue and Anna Wintour to help style his films. The Box is about to implement a security system designed by Safir Rosetti, which is run by former police commissioner Howard Safir. 50 Cent may perform at Times Square on New Year’s Eve. Salman Rushdie dressed up as Darth Vader on Halloween and had to fend off chicks with his light saber. Fox News correspondent Chris Wallace complained that only 39 American soldiers died in Iraq in October 2007, the fewest deaths in a month since 2004. Scores Stripper Not So Sure About Drag De La HoyaThe Scores stripper who had the photos of Oscar De La Hoya in drag is now saying she cannot “personally verify the authenticity of the images,” likely because she was threatened by De La Hoya’s lawyer. Lever House owner and real-estate mogul Abe Rosen is forcing tenants (including art collector Robert Wilson) out of his nine-story building on 67 Vestry Street to turn it into a luxury condo building. Miss USA Rachel Smith says she wants to be taken seriously as a TV reporter and not “end up like Katie Couric.” Donald Trump denied having once punched his second-grade music teacher, despite having written about the story in a book. Bruce Willis and his eight-person entourage were denied entry to Socialista at 3 a.m. Ivanka Trump’s jewelry line predictably does not include diamond grills. Dates with some hot firefighters are being auctioned off for charity at Turtle Bay Lounge tonight. Book Expo GalleyWatch: Which Fall Books Got the Biggest Push?